Here's how they stack up to a Frappuccino. Starbucks has always been a brand that encourages customization. From extra shots in your cappuccino to pumps and scoops of flavor in your macchiato to any dairy or non-dairy milk you please, the coffee giant has given customers with all kinds of palates and diets a way to make drinks their own. And while the company has, in recent years, committed to offering more vegetarian and vegan items, fully vegan beverages were a little harder to come by. 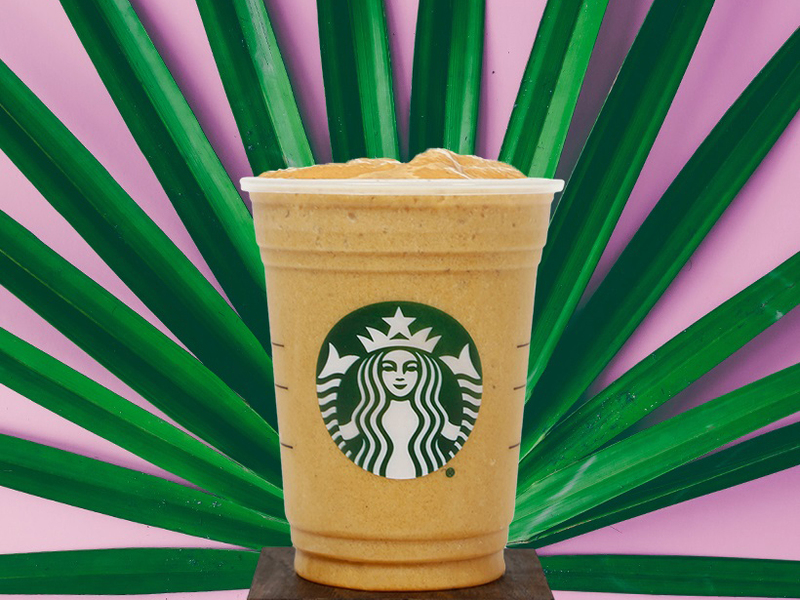 But this week, just in time for the waning months of summer, Starbucks debuted two new frosty coffee drinks for vegans (and non-vegans alike) to enjoy and even swap in for their usual protein shake: Almond Protein Blended Cold Brew and Cacao Protein Blended Cold Brew. Both beverages start with a base of cold brew concentrate, ice, and a date and banana fruit blend, as well as the new plant protein supplement (it’s made from rice and peas). The Almond Protein Blended Cold Brew also includes almond milk and almond butter, clocking in at 12 grams of protein, while the Cacao Protein Blended Cold Brew features coconut milk and a scoop of cacao powder and sports ten grams of protein. All of the ingredients in both drinks are certified vegan, a first for Starbucks, but a representative points out that cross-contamination behind the counter is possible so the final products aren’t being touted as such. So how do they stack up to the traditional Frappuccino? The Cacao Protein Blended Cold Brew melted and thinned out a little too quickly (before I got back to my desk!) to maintain it’s smoothie-like texture. In the end, it tasted like a watered down cold brew with a hint of bitter cacao. Honestly, not a bad thing in the summer heat, just not exactly what I expected from a blended drink. The Almond Protein Blended Cold Brew gets a major flavor and texture boost from almond butter and holds together a bit longer. It’s gritty, as one might expect from a drink with ground almonds in it, but overall it’s rich in almond flavor and the closest all-vegan Frappuccino replacement Starbucks fans can get their hands on. Neither drink comes off as completely cold-brew forward—not necessarily a good or bad thing, depending on your taste for coffee and certainly not a requirement for other Frappuccino flavors. What’s lost in both is the banana and date fruit blend, both in taste and texture. That’s not a huge minus, though it is listed in the ingredients so I went l looking for those flavors, but to no avail. Suffice to say any hint of sweetness in either drink is due to those fruits and, to my taste, it was just enough to be satisfying without feeling like I was drinking dessert. For me, as a casual, non-vegan Starbucks customer, both of these protein-packed drinks serve a more-business-than-pleasure function. But if you’re turning to your morning or afternoon pick-me-up for a protein fix (and happen to be avoiding dairy), these two beverage options will do the trick. Both drinks are currently available nationwide and selling for $5.95 (grande size only) while supplies last.